Note: There is an extended, new article on the Monatsschlössl & the Museum of Folk Culture available. 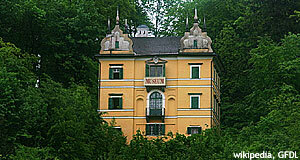 One of the branches of the former Salzburger Museum Carolino Augusteum is located in the Monatsschlössl between Hellbrunn Castle and the Zoo Hellbrunn. Built in 1615 for Prince Archbishop Markus Sittikus, the Monatsschlössl now serves as an ethnologic museum since 1924. The collection on display was started in 1904 and deals mainly with local and regional culture of the province of Salzburg. Traditions, customs, craft and costumes of locals will be of interest for many visitors, too. Traditionally painted furniture, monastic crafts and religious artworks or farming traditions can be explored in the Monatsschlössl.